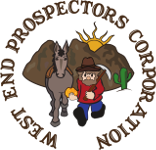 AMRA | West End Prospectors Corp.
AMRA is having another fun and exciting outing! New to prospecting or curious? Let us know and we will teach you how to pan for gold. You keep all the gold you find! Stay the night in our campground or just visit for the day!